Northeast PREP makes it easier to learn what public and private sector resources can be quickly harnessed to meet individual and company needs. Our coordinated network can quickly analyze needs, formulate a plan and assemble a team to put that plan into action. Check out our partners below to find which ones fit you and your business. Greater Hazleton CAN DO, Inc. is a private, non-profit industrial/economic development corporation serving Greater Hazleton in Northeastern Pennsylvania. For nearly 60 years, CAN DO has fostered economic activity in our community which resulted in the development of more than 4,200 acres of land and the creation of over 26,000 new jobs. CAN DO serves as a developer, builder, landlord, utility provider and business liaison while providing entrepreneurial support through our business incubator, CAN BE. As a Certified Economic Development Organization, CAN DO also offers business financing assistance and is approved to administer loans throughout Luzerne County. Economic development services in Carbon County began in the 1950s. Over the years, there had typically been two staff members, the Director of Economic Development and an Administrative Assistant. However, in the spring of 2013, CCEDC merged with the Carbon County Chamber of Commerce for greater capacity. 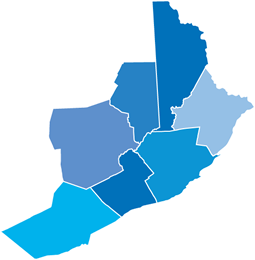 Its office is located in the Borough of Lehighton. Assist businesses with access to affordable financing. Market Carbon County to businesses interested in expanding or relocating to any of the industrial parks. Support the development of new business by developing a culture of entrepreneurship and providing access to available resources. CCEDC operates its own Revolving Loan Fund Program, administers loans for the Carbon County IDA and has recently received certification to administer PIDA programs. The Greater Wilkes-Barre Chamber of Commerce is a member-driven organization representing hundreds of businesses and organizations, focused on helping our members grow and succeed in Northeastern Pennsylvania. Learn more about: Location, Financing, or Growing your business. As Wayne County's lead economic development organization, WEDCO provides the services needed to bring new business to our county, support the business that is already here, improve the local tax base, and enhance the quality of live of our residents. We are a non-profit corporation comprised of businesses in partnership with state, county, and municipal government that realizes a bright economic future depends on investing and planning today. Learn more about: Location, Financing, or Growing your business. We provide confidential business consulting, training, and education supported by, strategic relationships and specialized programs through a team of experienced professional consultants dedicated and motivated to strengthen, enhance, and empower the small business community. Funding support and resources are provided by the Commonwealth of Pennsylvania in part by a grant from the Department of Community and Economic Development; through a cooperative agreement with the U.S. Small Business Administration and through support from Wilkes University. SBA's funding is not an endorsement of any products, opinions or services. SBA funded programs are extended to the public on a non-discriminatory basis.